We replace our old equipment with new as often as possible; therefore, everything in the gym is FOR SALE . Please inquire if you want more information or a piece of equipment you don’t see in the gym. We currently have a surplus of equipment in preparation for opening a third location. Visit our gyms to see if we have what you seek. Generally, pricing for used equipment is based on 50% of the replacement price, plus or minus an adjustment according to condition of the equipment and its availability. Some items sell for less because of limited demand, obsolescence, surplus, or lack of storage space. A few items, like Olympic competition trampolines are expensive because of limited availability in the Pacific. All equipment is sold, as is, with no warranties (unless contracted), and with an understanding that following sale of the item, the buyer assumes all risks and liability for transport and subsequent use of the purchased equipment. Because we want happy buyers, we try to do all we can for our buyers before and after each sale… ask for assistance whenever you need it. 2 boards in good condition, $300-$600 each. 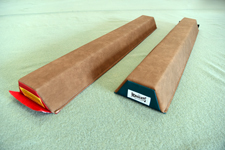 3 AAI suede and foam wrap-around/removable pad for beam training, good condition, $150. 4 Assorted other wrap-around/removable pads for beam training range are $100 each. 2 Floor level balance beams for all levels — preschool-elite for foot balancing, turns, leaps, and handstand drills. 12 These beams are ideal for all ages and all levels. Because they connect end-to-end they can be easily stored under/behind a couch and assembled to a full 16′ length. Because of their suede cover and foam density they feel like a real beam. Because they are close to the ground with a wide, non-skid bottom surface they are especially safe for training. We recommend these as the first training beams for aspiring students. While supplies last, buy more than one and get 10% off the total price. 14 AAI/American & Nissen Trampolines (bed sizes: 5′ x 10′, 6′ x 12′, 7′ x 14′) with frame pads (new or used of soft foam or firm ethafoam) and various spring options (8″, 9″, 10″, corner springs) and bed constructions (polypropylene, 1/4″-1″ webbing, Australian String, Canadian String, EuroTramp Web, … new or used). Inquire about components or entire systems. Complete used tramps (frame, frame pads, springs, transport wheels, and bed) begin at about $1800. Generally, 6′ x 12′ (bed size) trampolines cost $2000-3000; 7′ x 14′ cost $3000-4000; and high-end trampolines can cost over $10,000 ($4000 for the bed alone). We regularly ship to the neighbor islands (e.g., $100 to Maui) and can deliver on Oahu, if needed. Also, instructions are available for maintenance and opening/closing procedures as well as advise on safety, security, painting to match your house, and alternative installations and uses (e.g., in-ground, wrap-around decking, overhead canopy, overhead rigging for spotting belts and bungees, …). We have two Nissen and one Everlast folding trampolines with 5’x10′ beds (two are 2″ web and one is a black polypropylene fabric), good springs, new frame pads, and transport wheels. These are rare (i.e., difficult to find–a classic), take up little space, and should be collectors pieces that are passed on for generations. We have sold two to circus shows for trampoline clown routines. These trampolines can fold and roll onto a pickup truck bed in less space than an 8′ sheet of plywood (only these trampolines can be transported with the tail gate closed). We don’t know where tramps like this can be purchased anymore. These tramps should last another 30 years (with maintenance) or longer. Configurations vary across tramps but the package price is $1900 each. Make an appointment to see them. 2 Euro DMT with Euro web beds ($4,600 each). 1 Euro DMT with Rebound string bed ($5,200). (covers frames and springs: 4″ to 1″ taper) for a trampoline frame with a 6′ x 12′ bed (approximately 8.5′ x 14.5′ frame size), good condition, $350. (covers frames and springs: 4″ to 1″ taper) for a trampoline frame with a 6′ x 12′ bed (approximately 8.5′ x 14.5′ frame size), good condition, $400. (covers frames and springs: 4″ to 1″ taper) for a trampoline frame with a 7′ x 14′ bed (approximately 10′ x 17′ frame size), fair condition (worn & patched), $200. (covers frames and springs: 4″ to 1″ taper) for a trampoline frame with a 7′ x 14′ bed (approximately 10′ x 17′ frame size), new condition (worn & patched), two sets at $500 each. (lifts pads off springs to reduce noise, pad wear, and increase air flow — improves bounce) are usually placed three on each side and two on each end (10 per tramp), used $20 ea, new $25 ea. Trampoline beds of approximately 5′ x 10′ are on frames of approximately 7′ x 12′. Trampoline beds of approximately 6′ x 12′ are on frames of approximately 8.5′ x 14.5′. Trampoline beds of approximately 7′ x 14′ are on frames of approximately 10′ x 17′. 5′ x 5′ x 8″ Skills Cushions with Velcro on all four sides. 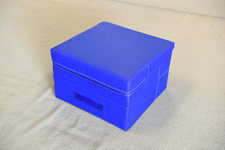 6 Blue 2′ x 4′ x 16″ wedge/slant/cheese cushions (when folded they are 2′ x 2′ x 2′). These are a must for preschool students! 10 Blue 5′ x 10′ x 8″ Cushions (crash pads/practice mats), good condition, $650 each. 12 Blue 6′ x 10′ x 8″ Cushions (crash pads/practice mats), very good to excellent condition, $750 each. We have sold hundreds of mats over the past two decades. Recently we started buying extra each year because of the demand during the year. We now have an inventory of prime quality panel and landing mats plus skills and safety cushions. 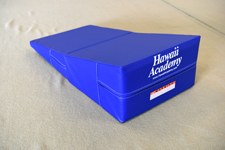 All are constructed of the highest quality 18 mil vinyl that should last way beyond other brands available in Hawaii (most mats are Norbert’s or AAI). For instance, we expect the panel mats (in 2ft panel sections) to last 30+ years. Blue 6′ x 12′ x 2.0″ folding (2ft) panel mats, velcro on ends and sides, custom made for extra durability, excellent condition, $500 for slightly used and $600 for new (in plastic bags). [Supply varies throughout the year because of multiple shipments. These are the most popular selling items in the gym. Blue soft foam throw cushions (crash pads/practice mats) for trampoline and other apparatus (ideal for under preschool equipment), very good to new condition. We are designing these cushions for many different applications so we have units with four handles, two handles, with mesh (for air release) and without mesh, all with a zipper (not Velcro) to replace the foam. 19 blocks/boxes (approximately 2′ x 4′ x 30″ and 4′ x 4′ x 30″ in 16# and 32# densities), vinyl covered, good condition, $300-$450 each. We use blocks daily, by all of our classes, for many purposes. They are more valuable than panel mats. We bought and made 32 but don’t need all of them in our gyms. Check the prices from Norbert’s and AAI to ship these items to Hawaii… these are a great value! 3 AAI blue vinyl covered 2′ x 4′ x 3′ spotting/training box with zipper, reinforced handles, 3 soft sides & 3 firm sides, good condition, $250. Phone to ask if there is something you need … we probably have it for sale or to rent/lease at a good price at one of our locations or in storage. We are probably the leading supplier in Hawaii of rental gymnastics equipment for movie and television productions, shows, exhibitions, conferences, displays, etc. Contact us for quotations and ideas for set and equipment designs. We have a licensed/registered ergonomists, engineers, and stunt trainers that specialize in human flipping, twisting, crashing, and equipment design.